Discussion in 'Thumpers' started by erbe, Apr 1, 2019. My problem is that the I can't adjust the stock clutch lever to operate it comfortably and being able to disengage the clutch. Either I am comfortable operating the clutch lever and not disengaging the clutch properly (like big time, not even possible to shift at standstill with running engine) or being able to shift smoothly but the lever is so far away from handlebar, that I have to use all fingers to get it. I spent hours to find a replacement for reasonable price, but it seems there simply are none. Yes there are, but shipped to EU would be more than 100eur. That is just not reasonable for me for one damn lever. 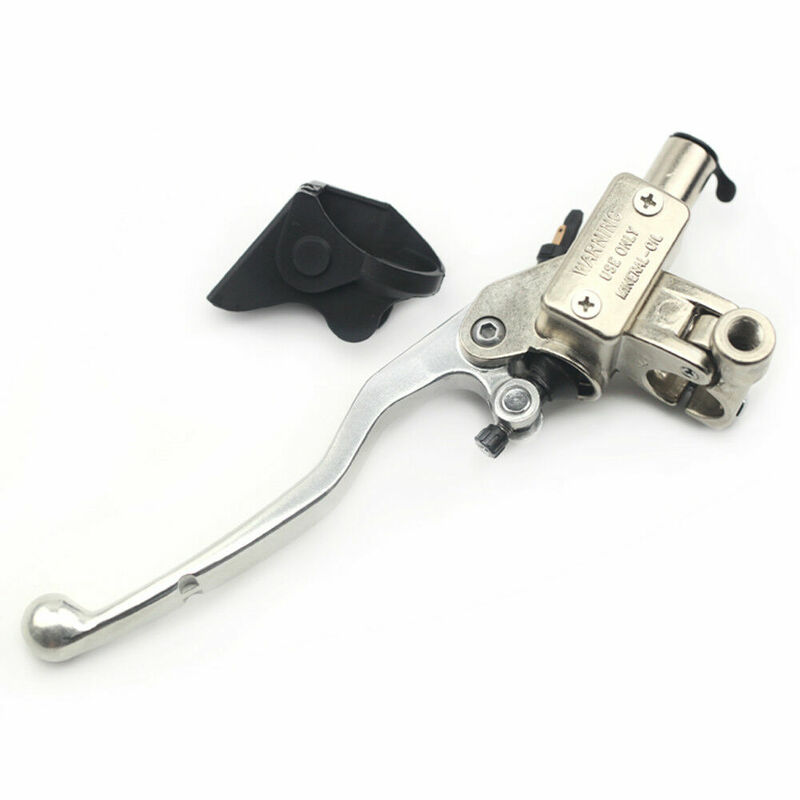 What I am thinking about is changing the whole master cylinder for something, that I can get a cheap and adjustable lever for easily. I am not the expert, but I guess if the master cylinder itself will have similar proportions it should work. So does anyone know it it is possible and that compatible ones I might try? Have anyone done this? Or am I completely wrong here? That looks to me to be the exact same that came stock on my TE630. I've known it as a Magura 163 master cylinder, and mine is the 9.5 mm. If I were you I'd spring for the new full master assembly, b/c I'm in the camp that says it's not a matter of if it'll fail, but when. As for levers, there should be many options out there that will bolt on to the master. Those are known to fail, and not have a long life expectancy. The issue has been that the anodized coating (inside of the barrel) starts to flake off, making it impossible for the plunger to get a good seal (thus leaking.) I've been through 2 rebuild kits and know it's one for, so I bought a Magura 167 Master Cylinder w/ lever. It's a direct bolt on and, as far as I know, doesn't have the same issues. Even better yet (and I should have done this, as I'm not a fan of Magura) are the Brembo clutch masters. Thank you for info! It is indeed the clutch of the Husky TE630, because AJP PR7 uses its engine. I will look into the Magura 167 master. But in the meantime do you have an idea which Brembo master will fit and work with our clutch? Tons of motor info on the TE 630 on the Cafe Husky site. Check it out, your bike is a cousin! Is George at uptite still around? I remember him selling x rings for the plunger that helped retain fluid where it should. Thanks again man, and didn’t mean to not credit you with the 167 option! erbe- you’ll get it sorted quick. All you need is a 9.5 master to go with your system, so a Brembo 9.5 should work. Conversely (this I’m pretty sure of, but not absolutely certain) you can go with, say, a 10.5 but then you’ll wanna swap to a compatible slave cylinder. And therein lies a potential rub also- something to be mindful of: these slaves (if yours also has the Magura slave) are not known to be very robust. They have a single o-ring that’s not uncommon to have fail. Oberon makes a robust replacement. I plan to change mine out soon. Thanks a lot for your replies guys! Just a quick question before I dive into the all the details. If I change the master for Magura 167, what lever compatibility will I get? What bikes use this master from stock? Because I am into this mostly for the short lever replacement, not reliability issue. My bike is brand new at the moment, I just can't operate the clutch comfortably and I am unable to find lever replacements for the old 163. If there are none for the 167 as well that is a no go for me again. So all that said, it would be ideal to replace it for the Brembo master, for which the lever is not a problem. I actually might have it on my Beta Xtrainer, so I might be able to just try it before buying the new master. But there is the issue with the bloody mineral oil vs DOT brake fluid again... Anyways, I will be changing the slave for Oberon replacement as well so when changing to Brembo master I should be able to fun the brake fluid inside the clutch, right? Maybe change the hose as well just to be sure. That one seems to give good adjustability to bring it closer in towards you. So with all the help from you guys and a local AJP dealer I located the aftermarket clutch lever that fits. It's Zeta ZE42-3182. I have not fitted it yet, but the dealer have tried it and reported that it fits. On basis of this I have also found some cheap ebay ones. I will report whether they will fit as well. Hopefully this will solve my problem. If not I will have to do the Brembo conversion.